Do you limit your shopping at the Broadway Farmers Market because you think the prices are too high? This just-released study by Seattle University’s Albers School of Business students may allay some of your fears. 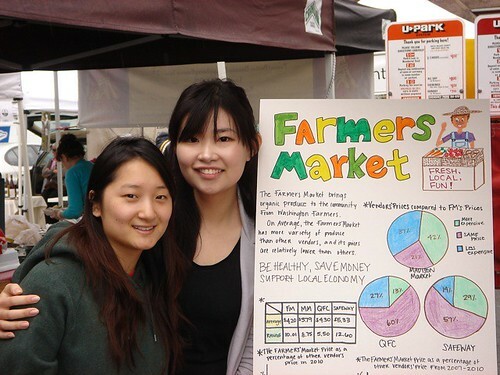 Statistics students in Professor Stacey Jones’ class conducted a small scale study comparing prices of 20 items at four grocers (Safeway, QFC, co-ops and Whole Foods), against prices at two market locations (Broadway and University District). Looking at the Capitol Hill dataset, Madison Market posed to be the toughest competitor to the Broadway Farmers Market. Of the 20 items compared, Madison Market had cheaper prices on 8 items. Prices were the same or equivalent (1 cent difference) on 4. And, Broadway Farmers Market had cheaper prices on 7 items (sweet onions could not be compared between the two because Madison Market did not carry them). But overall, the farmers market is, perhaps surprisingly, the best way to stretch your dollar. The average price was $3.82 for a Broadway Farmers Market item, $3.79 for a Madison Market item, $4.50 for a QFC item and $5.33 for a Safeway item. We have attached a writeup of the study by Albers student Michael Kaemingk (2010_Price_Study_Kaemingk), as well as the full dataset (2010HANDOUT) to this post. That is refreshing, surprising info. However that poster looks like a 4th grade science project…. 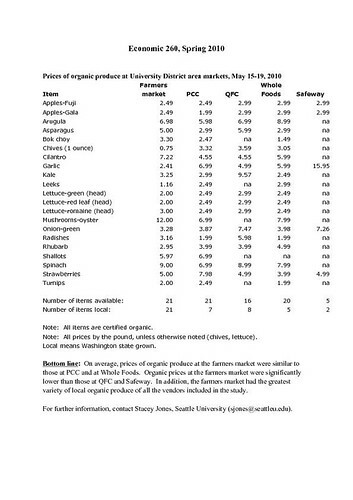 First of all, only organic fruit and vegetables were compared. Eggs, bread, and meat are also sold at the farmers markets, and these I’ve found to be much more expensive than even free-range, organic foodstuffs at supermarkets. Still, the main point is true: if you shop at the farmers market, you’re getting similar prices to the supermarkets, and it has the added bonus of being all locally grown — better for the environment, and you’re helping your local farmers. 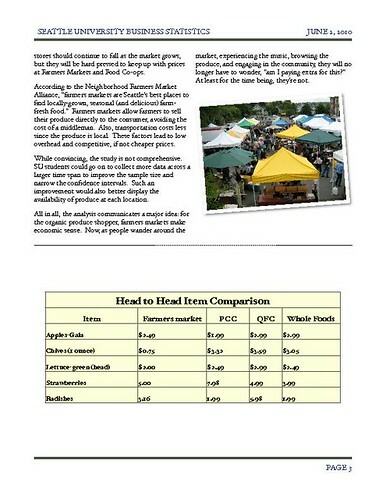 There is not a single shopper who does the farmers market for frugal/low price shopping. And in truth, many items are VERY VERY expensive. Flowers are well priced. Some cheeses are fair. Meat, out of sight. Greens are OK priced, fresh fruit, too expensive. If it is really quality, some of the bread is expensive, but, worth it. One of the bread vendors is well worth it. So goes shopping, all shopping. would a corporate art, shiny kinko’s produced poster make more sense here? or better valued? those kids drew that poster by hand! wish i had even a tenth of those artistic skills. my drawings truly look like a 4th graders work. I don’t care if the information is true or not…but seriously I might have more of some interest if it did not look like my little sister drew the graph with some crayons. Wow.